When we first unveiled Windows 10 in September, we outlined our plans for a new era of Windows. We wanted to create a Windows that empowered people and organizations to do great things. Our vision was one platform, one store, and one experience that extends across the broadest range of devices from the smallest screens to the largest screens to no screens at all. For Microsoft, Windows 10 begins to deliver on our vision for more personal computing. In this world experiences are mobile, moving with you seamlessly and easily across your devices. Interacting with technology is as natural as interacting with people – using voice, pen, gestures and even gaze for the right interaction, in the right way, at the right time. And in our connected and transparent world, we respect your privacy and help protect your information. From the beginning, Windows 10 has been unique – built with feedback from five million Windows Insiders, delivered as a service with ongoing innovations and security updates, and offered as a free upgrade* to genuine Windows 7, Windows 8.1 and Windows Phone 8.1 customers. Over the months we’ve demonstrated how Windows 10 delivers new capabilities to PCs, tablets, phones, and Raspberry Pi, with innovations like Microsoft Edge, Cortana, Continuum and Windows Hello, and how entirely new categories of devices like Hololens and Surface Hub, will be enabled with Windows 10. We are delighted to make Windows 10 available in 190 countries today. The launch of Windows 10 is being celebrated around the world with global fan celebrations and a new yearlong initiative to celebrate people and organizations making a difference around the world. We’d love to hear how you plan to help #UpgradeYourWorld. Starting today, you can vote for a global nonprofit to receive a cash donation by simply tagging their social handle and using #UpgradeYourWorld and #vote on Instagram, Facebook, or Twitter. More information on Upgrade Your World can be found at http://www.windows.com/upgradeyourworld. Together with our partners, we’re ready for a new era of Windows – we hope you’ll join us. With the familiar Start menu, Taskbar, and Desktop you’re already an expert and Live Tiles provide streaming updates of what matters most to you, instantly. Windows 10 is designed to be compatible with the hardware, software and peripherals you already own. Free updates help keep you current on features and security updates. With OneDrive online storage, you can easily share and keep your files up to date across all your devices, simply. Offering enhanced Windows Defender and Smart Screen to help safeguard against viruses, malware and phishing. 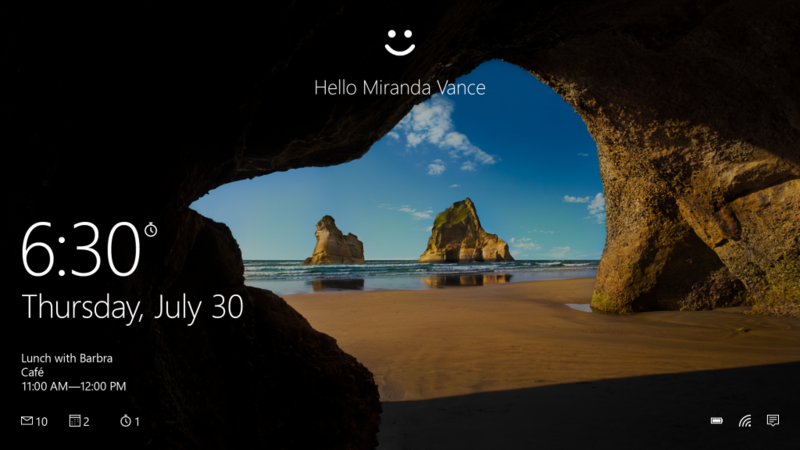 Windows Hello** greets you by name, providing a fast, secured, password-free way to log in. Voice, Pen and Gesture input allow you to more naturally interact with your PC. Windows 10 is designed to run Office and Skype perfectly to increase your productivity. New Office Mobile apps on Windows 10 – Word, Excel, PowerPoint, and OneNote – are available today in the Windows Store. Built for on-the-go scenarios, the Office Mobile apps offer a consistent, touch-first experience for small tablets. Full featured OneNote comes installed with Windows 10 for your digital note-taking needs. The upcoming release of Office desktop apps (Office 2016) will offer the richest feature set for professional content creation, designed for the precision of a keyboard and mouse. Cortana*** is your personal digital assistant making it easy to find the right information at the right time. You can easily switch between apps and stay organized with Snap and Task View. Continuum optimizes your apps and experience beautifully across touch and desktop modes. New Microsoft Edge browser allows you to quickly browse, read, and even mark up and share the web. The integrated Xbox App delivers the Xbox experience to Windows 10, bringing together your friends, games, and accomplishments across Xbox One and Windows 10 devices. The Companion Phone app lets you set up your iPhone, Android or Windows phone to work seamlessly with your Windows device. Windows powers the most innovative devices today and tomorrow – from phones to tablets to PCs to HoloLens. Built-in apps including Photos, Maps, Microsoft’s new music app Groove, and Movies & TV, offer entertainment and productivity options. Feedback from millions of IT Pros has helped shape our best enterprise version of Windows ever. Ready for corporate deployments, Windows 10 will help your company protect against modern cyber-attacks, deliver experiences your employees will love and enable continuous innovation with a platform that keeps your company up to date with the latest technology. Your business can control the frequency of your updates and select the features and functionality that is right for each group of your employees. Windows 10 includes built-in enterprise grade security, so employees can replace passwords with more secure options, help protect corporate data and corporate identities, and only run the software you trust. New management and deployment tools simplify device management and help lower costs, and enable you to power your business with the enterprise strength of the Azure cloud. We encourage small businesses to take advantage of the free upgrade offer to Windows 10 from genuine Windows 7 and Windows 8.1 PCs and tablets. And, we encourage all enterprise customers to begin testing and planning your deployment now. More information for business customers is available here. 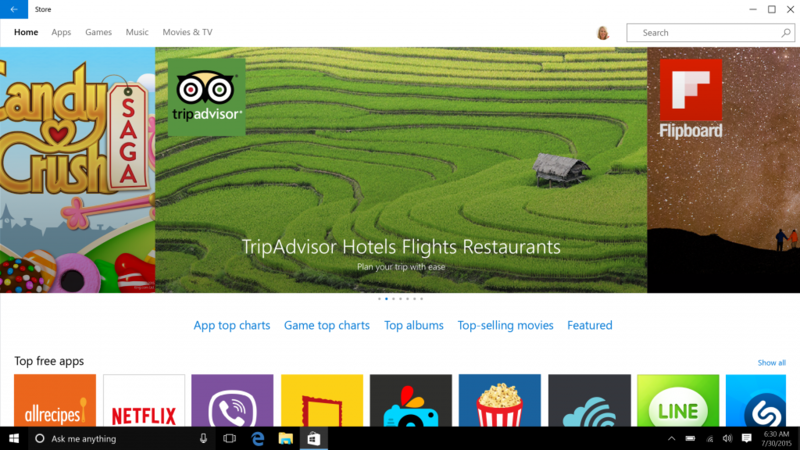 The new Windows Store opens today and is now accepting new apps for Windows 10. The Windows Store offers one-stop shopping for popular free and paid apps, games, movies, TV shows and the latest music, which work across all Windows 10 devices. The new Windows Store is the only Store where you can use Cortana to control apps with your voice and get real-time notifications on your app tiles. All Windows Store content is certified by Microsoft to help keep your devices safer. In addition to existing Windows 8.1 apps such as Netflix, Flipboard, Mint.com, Asphalt 8: Airborne and The Weather Channel, the Windows Store provides a constant stream of new and updated Universal Windows Apps and games, including Twitter, “Minecraft: Windows 10 Edition beta”, Hulu, iHeartRadio, USA Today, Candy Crush Saga, and others including WeChat and QQ, which will launch soon. Check out our new Windows Store today. Windows 10 provides a platform for great experiences and we’re excited to work with partners around the world on all new app experiences. The Windows 10 SDK is available to developers beginning later today, and we look forward to seeing what developers create for Windows 10. 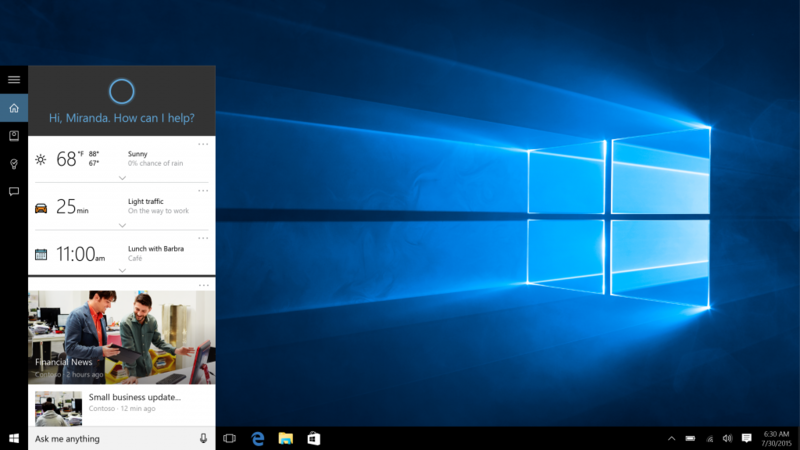 More information on the latest on developer tools for Windows 10 is available here. We are excited to begin delivering Windows 10 to the world today. We’re really pleased with the strong response to Windows 10 since we kicked off upgrade reservations in early June, with millions of reservations. As we shared in early July, we want to make sure all of our customers have a great upgrade experience, so we’ll roll-out Windows 10 in phases to help manage the demand. 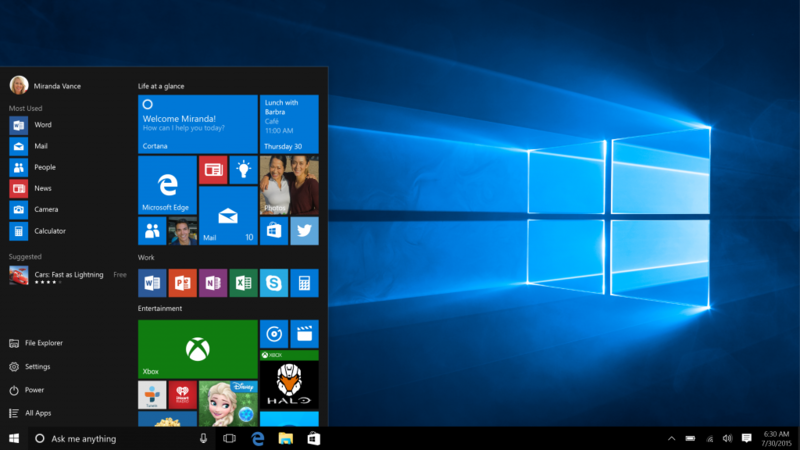 Upgrading to Windows 10 is easy if you have a genuine Windows 7 or Windows 8.1 PC or tablet. Starting today, a new notification on your taskbar will alert you when your upgrade is ready to be installed. For business customers, Windows 10 is available to start deploying within your work environments and starting August 1, organizations who have volume licensing can upgrade to Windows 10 Enterprise and Windows 10 Education. Windows 10 IoT is also available today. Devices from our valued partners Lenovo, HP, Dell and Acer with Windows 10 pre-loaded are available for purchase today from retailers globally. Many more devices will follow in the coming weeks from a broad range of partners including new devices designed specifically for Windows 10 features like Windows Hello. Our OEM partners have over 2,000 distinct devices or configurations already in testing for Windows 10 upgrades, as well as hundreds of new hardware designs. By this holiday, we will be selling the widest range of Windows hardware ever available. We’re grateful to our retail partners, who are ready to help people upgrade to Windows 10, including Best Buy, Bic Camera, Croma, Currys/PC World, Darty, Elkjøp, Fnac, Jarrir, Incredible Connection, Media Markt, Microsoft Stores, Staples, Yamada, Yodobashi and many more leading retailers from around the world. Upgrading to Windows 10 will be easy with the largest tech bench program ever, over 100,000 trained retailers, and tens of thousands of stores around the world. Thank you to our Windows Insiders for helping us build Windows 10. If you’re a Windows Insider and running build 10240 – you already have the Windows 10 we are making available today. All you need to do is check Windows Update and make sure you have all the final updates. If you didn’t upgrade to the latest build as a Windows Insider, you can upgrade here. The Windows Insider Program will continue, and we will have more details to share soon about the next wave of the program. Thank you to our partners for helping us deliver amazing Windows 10 experiences and devices to the world. And thank you for considering Windows 10 – whether a long-term Windows fan, or perhaps a new one. We’re just getting started – Windows 10 will continue to get better and better – and we’d love for you to join us.